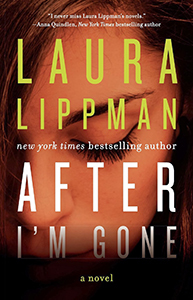 There’s no end in sight to my Spouses with Secrets reading list, and After I’m Gone definitely deserves a spot on there (although, to be fair, everyone in Laura Lippman’s books has sinister secrets). I’m a fan of Lippman’s serial mysteries as well as her stand-alone suspense novels, and while her recurring sleuth Tess Monaghan makes a cameo, this falls more in the latter category. While there is a mystery to be solved, it’s a decades-old cold case (based on a true story), and the book is more about exploring the effects of a disappearance on the family who’s left behind. When rakish, dangerous Felix Brewer meets Bambi Gottschalk at a dance in 1959, it’s love at first sight. Spoiled and over-reliant on her astonishing beauty, Bambi assumes she’ll have no trouble snagging a handsome doctor or lawyer who will keep her in high style. Instead, she falls for Felix, who assures her they’ll have plenty of money — but not always legally. They have three daughters, and the family seems happy and successful… as long as Bambi ignores the steady stream of mistresses and girlfriends that Felix keeps on the side. Suddenly, in 1976, Felix, charged with felonies and facing years in prison, vanishes overnight. Exactly ten years later, Julie, the mistress who helped him flee disappears as well, and everyone assumes that she’s gone off to join Felix — until her badly decomposed body is found in the woods. Her murder is never solved, Felix is never caught, and Bambi and her daughters are left with a lifetime of unanswered questions. In the present day, widower Sandy Sanchez (what is it with these names?) is a retired Baltimore detective working cold cases as a consultant for extra money. He starts investigating the unsolved case of Julie’s murder, and as he learns more about the complexities of Bambi and Felix’s troubled marriage, Sandy ponders his own long relationship with his wife Mary, who has recently died of cancer. Will uncovering the truth bring long-awaited closure and healing, or simply rip open painful old wounds? Because the mystery spans 30-plus years, there’s a lot of flashing forward and back, so it’s essential to read the date-stamp at the beginning of every chapter to understand where in the timeline you are. The story is meant to be a character study, but many readers won’t find these characters very relatable or realistic: the women are gorgeous and manipulative, the men are predatory and deceitful, and everyone’s exploiting everyone. And if you don’t care about them as people, then you won’t care much about the disappearance of a not-very-good-guy from their lives. Fans of Lippman’s usual taut, twist-filled suspense novels may want to give this slow-moving true-crime tale a miss.